C’est avec du retard que je poste cette première interview d’auteur, effectuée lors du 41ème Festival International de la Bande Dessinée à Angoulême (F.I.B.D.). En soi, ce retard n’est pas très grave, car l’interview ne concerne pas l’actualité de l’auteur… Et oui, contrairement à ce que fait la majeure partie des journalistes culturels de presse, écrite, audio, ou visuelle, je m’intéresse au processus de création (et non-pas à ce qui se vend, ou ce qui se vendra). Alors « processus de création » c’est un peu pompeux, mais c’est ce qui compte vraiment. Comment un auteur de bande dessinée arrive-t-il à retranscrire sa pensée sur la planche ? S’il est scénariste, comment parvient-il à transmettre son message au dessinateur ? S’il est dessinateur, comment réussit-il à dessiner l’histoire ? Et s’il est auteur complet (dessinateur et scénariste) comment traduit-il sa pensée en bande dessinée ? Dans le cadre de ces questionnements j’ai interviewé Rajko Milošević-Gera, dit R. M. Guera ou Guéra. 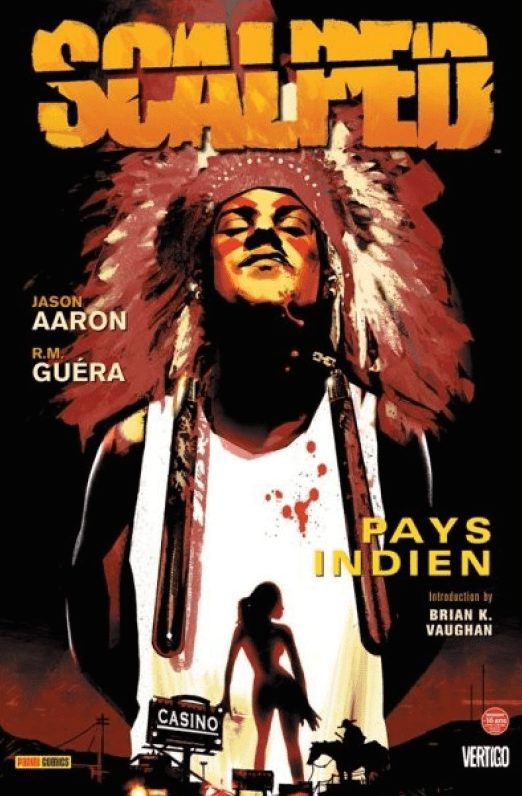 D’origine serbe, il fait ses premières planches en Yougoslavie, puis il embrasse la célébrité avec sa série culte : Scalped, publiée par Vertigo (Urban Comics en France). Je l’ai rejoint le 31 janvier, au stand Urban Comics au F.I.B.D. Notre entretien a duré un bon quart-d’heure, et nous avons discuté de création bien sûr, mais aussi des bandes dessinées au sens large et de ses influences. L’interview suit directement, et à la fin il y a une petite vidéo cadeau ! Adrien Vinay : Hello Mr. Guéra, I’m here to talk about creation in designing comic books. So, can you tell me about your work ? Specifically, how did you became a comic’s creator ? R. M. Guéra : Basically, it’s the need, to express myself. So it’s the same thing as a painter, as a romancer, you have the need. In the court of this need, as I discover, are not even feelings, I think it’s the story, I think it’s close to poetry. Story about somebody… Someone with a story behind… How was it to be this person in those circumstances ? This is what seize me most… So, being close to story, to make her right, I discovered with time that is really close to poetry: we have to reduce somebody’s situation, or life, or important moment, to a panel or two, on page. This is a nice challenge. And the point is not to illustrate, the point is to express. So I try to illustrate, I do technical stuff because I know how to do it… What I really want is to express, to justify, emotionally, the script: this is the all aim! And if I look at a good comic, I don’t look if the drawing is good, I don’t look if the dialogues are good, I look if they are together: if the script and the drawing are together. This is quality for me, this is the main thing for me, the most important thing for me. If they work together, this is good. Because we read about the story, we don’t read about the drawing, we don’t read about the dialogue. We read about that, about this people there! So this is what inspired me most, this is what I try to mingle my talent in. Technically, how do you build an album ? Do you have some steps in your construction work ? Is it again about the combination of dialogues and illustration ? Yes, I have to express this stuff, not just illustrate this stuff… It need to be justified, it just need to be accepted by the reader, so this is my work. And you know, I have a colorist, Giulia Brusco, she’s the third one in the roam, so she has to justify my black-and-with page to make it more together, that was the all thing we work on, this is our aim. To make good story, to make the combination matters, not more. According to you, generally, are comic books difficult to read ? I think it’s incredibly powerful medium, and I think the time for comics is coming because with all this technical advance with computers and things… I think we’re very close to time where the grace is what matters, not technical advancing. It’s not how graceful the comic is, aesthetically or whatever… If I do water-colors now, and I don’t want to use computers, it’s because the grace of imperfections it makes is nice for me. In using computers, you can reach everything, it’s so advanced… You know, the computer is better than me, but computers doesn’t have a grace, I have a grace. So if I give grace to my drawings they’re gonna have it. And I’m trying to prove it to younger artists, to my colleagues, that the point is grace, not technical perfection. And your comic books, are they difficult to read ? You told me you like Jean Giraud, Mœbius ? Yes, but more than the top, there is no criterial for him, he’s over the top. I miss him a lot, I didn’t know I’m gonna miss him… Everybody knows he’s gonna die one day, but I really miss him a lot, just thinking about him… What is gonna do next month ? He was a great light. More generally, according to you, what is the social place of comic books? What is the place of comic books in society ? What is the place of comic books in art schools ? I don’t know, I’m not sure… I think it should be accepted. How? I don’t know, but it should be accepted as a justified form of art. It shouldn’t be something interesting like Pop Music, it’s not. If you see Sergio Toppi10 or so many guys, they should have their kind of philosophy that have an explained place in art. Even more clear than they are now. It should be more accepted in its own terms, because it deserved it. What do you think about archiving comic strips ? It depend on artist! The main thing is to keep everything to the moment you’re in. When I work, the most important thing is not the drawings, the most important thing is to take out of me as much as I can. As I told you, it’s not about illustrating, it’s about expressing, it’s very different. I want to know about a comic books artist or writer, what do they express in their work, not what do they illustrate. The point is that line is your feeling, line is you, you are the line, so take it up! Make it live, make it be something else. Do you know digital publication ? If so, which one ? Yes… Django11 actually… I’m very absent, I have so much work, I don’t read that much, I read books a lot… I don’t have time, it’s really difficult for me, I have my heroes, I have so many things to do ! 1 Robbins Frank (1917 – 1994), dessinateur, peintre et auteur américain de comic books (Batman, The Shadow, Ghost Rider, Flash…). 2 Jijé, Joseph Gillian (1914 – 1980), scénariste et dessinateur belge de bandes dessinées (surtout connu pour son travail sur Spirou et Fantasio, il a également dessiné Superman et Jerry Spring). 3 Franquin André (1924 – 1997), scénariste et dessinateur belge de bandes dessinées (surtout connu pour son travail dans Spirou et Fantasio, Gaston Lagaffe et Idées Noires, il est aussi le créateur du Marsupilami). 4 Davis Jack (1924), dessinateur américain de comic books (surtout connu pour son travail chez E.C. Comics avec Tales from the Crypt, et chez Mad Magazine). 5 Wood Wallace Alan, Wally Wood (1927 – 1981), auteur et éditeur américain de comic books (surtout connu pour son travail chez E.C. Comics et chez Mad Magazine). 7 Cartier-Bresson Henri (1908 – 2004), photographe français (ayant obtenu de nombreuses récompenses, notamment le Grand Prix National de la Photographie en 1981, un nombre très important de recueil, photos et de films forment son palmarès imposant : une exposition au Centre George Pompidou lui est consacrée depuis le 12 février, et jusqu’au 9 juin). 8 Blake William (1757 – 1827), peintre et poète pré-romantique britannique (surtout tourné vers la poésie, il est connu pour son style moderne et presque prophétique). 9 Karabatic Nikola (1984), joueur de handball français. 10 Toppi Sergio (1932 – 2012), dessinateur et scénariste italien de bandes dessinées (surtout connu en tant que maître du dessin en noir et blanc). 11 Django Unchained est un comic book dont le scénario et écrit par Quentin Tarantino usant d’une des premières versions écrite pour le film éponyme. R. M. Guéra en est le dessinateur.